Elisabeth Beckwitt, AKA Nashville’s Pansexual East Side Queen, has been hard at work in the studio. She has a brand new single, “Free Fall,” coming your way on May 3rd which is the leading single off of her upcoming EP titled Indigo. While the instrumental aspect of her music has transformed over time, as with Beckwitt’s previous releases, each track on Indego is intentional and tells a deeply personal story. Beckwitt’s enthusiastic approach to sensitive subjects and tricky topics has propelled her through the otherwise hard to navigate waters of mental health struggles and addiction, which were the focal points for her previous EP, Gray Again. 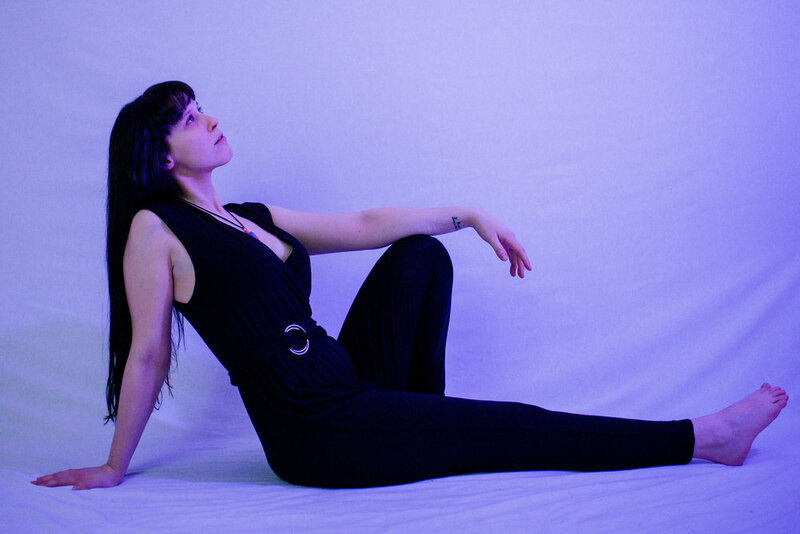 I recently chatted with Elisabeth about her upcoming EP, the music video for “Free Fall,” owning your sexuality as an artist, and her monthly music showcase Sad Girl Night. Read the interview below! Q: Your upcoming EP “Indigo” takes a different path than your previous release. How did the stylistic transition happen, and was it an intentional change? A: This project really feels like a continuation of my artistic and personal growth. My last record was about the darker side of my recovery, and I really wanted Indigo to feel like a celebration of the progress I've made so far. The whole EP was produced by my dear friend Jason "Fresh" Threm of TME, who has the incredible ability of translating the intention behind my songs into production for the songs themselves. He created this entire world inside his brain and had such a specific idea for each song. I loved watching him work and it felt so genuine to the story I was trying to tell. At the time I was really getting more into pop music and the different things that genre can mean right now; I was listening to a lot of Halsey and Julia Michaels, and he ran with that so beautifully. Q: The leading single from the EP, “Free Fall,” dives head first into the world of new relationships. How did the concept for the music video come together? A: “Free Fall” is a story that we all know, and the music video is an ode to my LGBTQ+ family, exposing the bad, the good, the scary, and the vulnerable side to falling for someone new. This whole record is about finding the balance in life and this song shows a journey of one woman finding the balance in her sexuality. The moment right before you fall for someone is sometimes more exciting than the actual falling. That is what this song is about - taking the chance even though it's new and not what you're used to. “Free Fall” is a love song to anyone queer and alone; we've all been there in that moment where the world will end if she knows how you feel. This is my gift to you in that moment. Love yourself just enough to believe that you will get through this, and let yourself fall. Q: You own your sexuality, which in turn inspires others to do the same. Have you ever felt apprehension when using specific gender pronouns in your music when talking about a love interest, and how did you overcome that? A: Honestly, I have never been apprehensive when using specific gender pronouns in my songwriting. I am Pansexual, and being a part of the LGBTQ+ community has been a huge part of my life since I came out over 10 years ago. My writing is intrinsically tied to my personal experiences, and when I am telling the story of a previous love, I need to make sure that it speaks the truth more than anything else. That being said, I have had moments of doubt and fear when I perform these songs, specifically when I am touring across the South and Midwest. All I can do is try to put enough love and kindness out into the world and hope that it comes back around. And hope that it helps someone who may be struggling to accept their truth know that they are beautiful and loved. Q: When penning deeply personal lyrics for a new song, how do you find the balance between speaking your truth while making the lyrics relatable for people from different walks of life? A: This is a great question, and one that I know a lot of artists struggle with. I try to speak universal truths to things through my own personal lens. For example, “Free Fall” is a queer love story AND we can all relate to the simple truth that new relationships are TOUGH and take some figuring out. “Indigo,” the title track written with Ian DePriest and Steffi Jeraldo, is about addiction recovery AND I believe that we can all relate to the struggle of how hard it is to let go and choose to practice self-love above all else. Q: Your monthly artist showcase, Sad Girl Night, has created a special community within the Nashville music scene. How did the first Sad Girls Night come into existence, and what has been your favorite part of hosting it so far? A: I feel like everyone can relate to the idea of "Sad Girl Music" in one way or another. Whether the picture in your head right now is a girl with a guitar crying about a boy, or a badass warrior queen angrily preaching about self-love - you can relate. We started Sad Girl Night as a way to celebrate women for all their strength, vulnerability, and power! It is a safe and accepting space to practice empathy and acknowledge that all feelings are valid and we are all beautiful. The first event was in September of last year, and it has been crazy how fast this community has grown. My favorite part of hosting has been jamming out like a total fan girl to all of my favorite female artists in Nashville. I am just so astounded by all of the female talent in this town. Thank you to anyone who has supported this community, I love you with my whole heart!